In the first post on fault trees I used the term cut sets to refer to any combination of fault tree initiators that can produce the fault tree’s top event. There may be many – sometimes very many – cut sets in the complete collection of cut sets for a tree. The probability of the top event is, roughly speaking in most cases, the sum of the probabilities of each cut set. The probability of each cut set is, in most cases, the product of the probabilities of each initiator in that set. The previous two sentences describe how things are most of the time. The exceptional cases – when they exist, are important. If the initiator probability of all events were 0.5 (an unlikely value for any real world initiator event, chosen here just to make a point), the probability values of each cut set would be the product of the probability values in each set (two of which have only one event). Earlier I said that the top event probability in most, but not all, fault trees roughly equals the sum of the probabilities of all the cut sets. In this case that sum would be 1.125. We know that can’t be right since a probability cannot exceed 1.0. P(1,2,3) = P(1) + P(2) + P(3) – P(1) * P(2) – P(1) * P(3) – P(2 * P(3) + P(1) * P(2) * P(3). The generalized form of the equation for the top event probability requires more math than we need to cover here. The Wikipedia entry on inclusion-exclusion principle covers is a good reference for those needing details. A rough summary is that we subtract the probabilities of each combination of even numbers of cut sets and add the probabilities of each combination of odd numbers of cut sets. The resulting equation for the top event probability of a tree modeling faults in a complex system can have billions of terms. No problem for modern computers. Perhaps a better example of rearrangement of a fault tree into and OR of many ANDs is the tree below. Note that the AND gate in the rendering below the green line has six child events. The single black vertical line leading from the bottom of the gate joins six branches. Using this drawing technique prevents the clutter that would exist if we attempted to draw six separate parallel vertical lines into the bottom of the AND gate. + P(1,3,4) * P(1,3,5) * P(1,3,6) + P(1,3,4) * P(1,3,5) * P(2,3,5) …, etc. 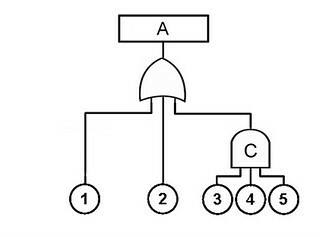 where P(1,2,3) equals P(1) * P(2) * P(3), because initiator events 1, 2, and 3 are required to be truly independent of each other for the fault tree to be valid. Fault tree software handles the tedious and error-prone job of calculating the top event probability and the probabilities of all intermediate events. While the rules of fault tree construction require all initiator events to be truly independent of each other, nothing says the same initiator event cannot appear in multiple places in a tree. In fact, for redundant systems, this happens often. We need to give this situation special attention. Its ramifications for system design are important. 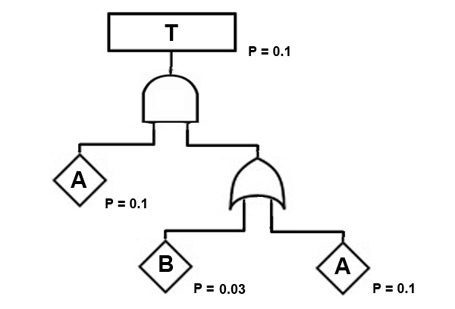 Consider this simple fault tree on the left below, noting that the same basic event ( event A) appears in two branches. On first glance, one might conclude that the top event probability for this tree would be 0.1 * 0.1 = 0.01, since the top event is an AND gate, and AND nominally indicates multiplication. But the tree is modeling a real-world phenomenon in which if event A happens, it happens regardless of our symbolic representation. Or, from an analytic standpoint, we can refer to the rules of Boolean algebra. A AND A is simply A (from a rule known as idempotence of conjunction). So the collection of cut sets for this simple tree contains only one cut set; and that cut set consists of a single event, A. Since the probability of A is 0.1, the probability of T, the top event, is also 0.1. Both common sense and Boolean algebra reach the same conclusion. Complex fault trees can vastly exceed the grasp of our common sense, and “A AND A” cases can be concealed in complex trees. Software that applies the rules of Boolean algebra saves the day. 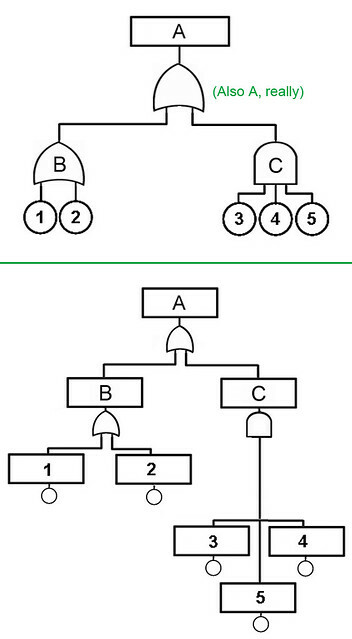 Idempotency of disjunction (image on right, above) similarly leads us to conclude that replacing the above tree’s AND gate with an OR gate (fault tree on right, above) yields the same cut set collection – a single set having a single event, A. But A OR (A AND B) equals simply A. That is, disjunctive absorption removes cut set 2 from the cut set collection. In a real-world fault tree, complexity may make cases of disjunctive absorption much less obvious; and they often point to areas of ineffective application of design redundancy. Idempotency reduces cut set 1 to A alone, and disjunctive absorption eliminates cut set 2. Thus, conjunctive absorption can be derived from disjunctive absorption plus idempotency. 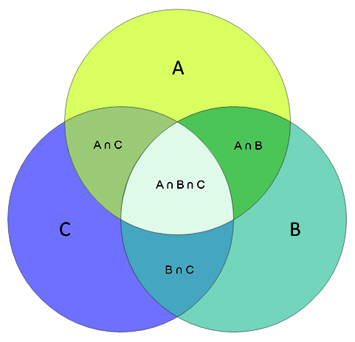 In short form, A AND (A OR B) equals simply A. The simple fault trees above would never occur in the real world. But logically equivalent conditions do appear in real-world trees. They may not be obvious from inspecting the fault tree diagram; but they become apparent on viewing the cut set collection. A cut set collection from which all supersets have been eliminated (i.e., absorption has been applied) is often called a minimal cut set collection. Back in the dark ages when computers struggled with fault tree calculations, analysts would use a so-called gate-by-gate (i.e. bottom-up) method to calculate a top event probability by hand. The danger of doing this, if a tree conceals cases where idempotency and absorption are relevant, is immense. Given that real-world initiator probabilities are usually small numbers, a grossly wrong result can stem from effectively squaring – without being justified in doing so – an initiator probability. I mention this only because some textbooks published this century (e.g. one by the Center for Chemical Process Safety) still describe this manual approach – a risky way of dealing with risk. A more important aspect of the concepts covered here is the problem stemming from a fault tree that does not model reality well. Consider, for example, a fault tree with 10,000 cut sets. Imagine the 1000th most probable cut set, based on minimal cut set analysis, has a probability of one per trillion (1E-12) and contains events A, B, and C.
Imagine further that events A and C each have probabilities of 1E-5. 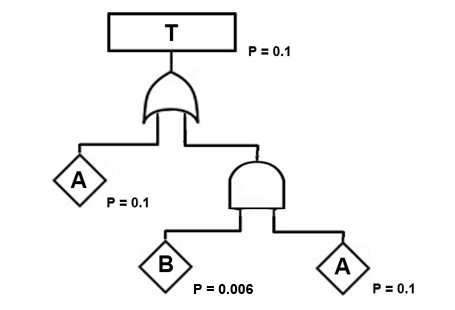 If A and C turn out to be actually the same real-world event – or they result from the same failure, or are in some other way causally correlated – that cut set then reduces to events A and B, having a cut set probability of 1E-7. This probability may be greater than all others in the collection, moving it to the top of an ordered list of cut sets, and possibly into the range of an unacceptably likely top event. Environmental factors like flood, fire, lightning, temperature, epidemic, terrorism, sabotage, war, electromagnetic pulse, collision, corrosion, and collusion must enter almost any risk analysis. They can do so through functional hazard analysis (FHA), failure mode effects analysis (FMEA), zonal analysis (ZSA) and other routes. Inspection of fault trees to challenge independence of initiator events requires subject matter expertise. This is yet another reason that fault trees belong to system and process design as much as they belong to post-design reliability analysis. San Francisco’s Retirement Board has seven members, three elected and four appointed. They manage a Defined Benefit fund for the San Francisco Employees’ Retirement System (SFERS) on behalf of its 50,000 members. The board sets policy for the fund, allocating the split between stocks, bonds, property, private equity and hedge funds. The board also oversees a $2.8B Deferred Compensation plan and selects investment options. Two years ago the CIO recommended that $3B (15%) of assets should be in hedge funds. Police and fire unions strongly supported the 15% position. However, opposition by beneficiaries caused the hedge fund investment to be capped at $1B. At the time the CIO was pushing for 15% in hedge funds, their high risk, high fees, and poor liquidity were in the news, as was the problem of hedge fund transparency. It seems memories fade fast in financial circles. Bankruptcy of Bear Stearns’ “High Quality” hedge fund in 2008 forced a bailout of the highly successful investment banking firm, which serves as a reminder of how the “straight rule” of induction lures Hume’s chicken into thinking the farmer has the chicken’s longevity in mind. It may be that SFERS lacks even the sense of Hume’s chicken, which might have been skeptical had the farmer previously shown signs of interested not aligned with those of the chicken. SFERS’ misadventure in the FX Concepts “currency overlay” hedge fund in 2013 counts as such evidence. In 2014 CalPERS (the CA Public Employees Retirement System) decided to move $4B out of hedge funds. Because of illiquidity of the funds, CalPERS still has positions in those funds. In June 2016, the Retirement Board voted 4-1 to put $500M in a customized fund of hedge-funds program. Herb Meiberger, a commissioner of SFERS, asked for the names and funding amounts of the fund managers. Executive Director Jay Huish told Meiberger that info was confidential and that fund managers would be selected behind closed doors without disclosure or public involvement. More evidence. Meiberger clearly takes a risk-based approach to governance, and stands out from a majority of “what could possibly go wrong” board members. As psychologists have noted, humans are naturally ill-suited for rational assessment of risk. Meiberger is running for membership on the SFERS board again in January 2017. We need more officials that have a clue about risk management. In post 1 of this series I stressed that fault trees were useful in the preliminary design of systems, when alternative designs are being compared (design trade studies). I argued that fault trees are the only rational means of allocating redundancy in complex systems. 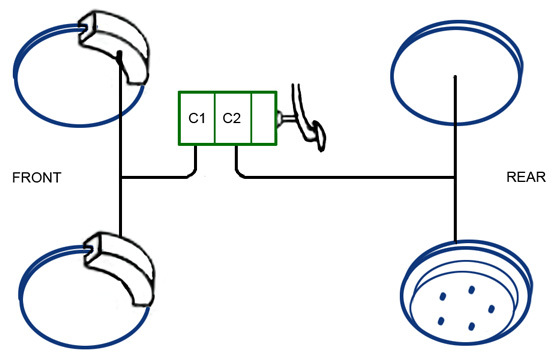 In that post I used the example of a crude brake system for a car. It consists of a brake pedal, a brake valve with two cylinders each supplying pressure to two brakes, and the hydraulic lines and brake hardware (drums, calipers, etc.). I’ll use that simplified design (it has no reservoir or other essentials yet) again here. We’ll assume that pressure sent to either the front wheels alone or the rear wheels alone delivers enough braking force that the car stops normally. Note that this also means the driver would, using brakes of this design, not know that only two of four brakes were operational. For sake of simplicity we’ll model the brake system as having only two fault states: front brakes unable to brake, and rear brakes similarly incapacitated. While we would normally not model the collection of all failure modes resulting in loss of braking capability to the front brakes as a basic event (initiator), we’ll do so here to emphasize some aspects of redundant system design. 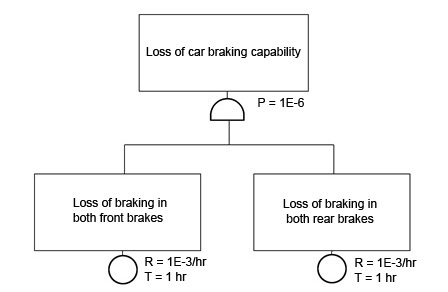 If we modeled the total loss of braking using the above fault tree, we’d be dead wrong. Since the system, as designed here, is fully redundant (in terms of braking power), many failures of either front or rear brakes could go unnoticed almost indefinitely. To make a point, let’s say the maintenance events that would eventually detect this condition occur every two years. To correct the fault tree (leaving the system design alone for now), we’d start with something like what appears below. Note that with the specified failure rates, the probability of either the front or rear brakes being in a failed state at the beginning of a drive is roughly equal to one, using the standard calculus of probability given an exposure time and a failure rate based on an exponential distribution. This means that, as modeled, the redundancy is essentially useless. We call the failure that goes unnoticed for a long time period a latent failure. That fault tree isn’t quite correct either. It models the rear brakes as having failed first – a latent failure that silently awaits failure of the front brakes. But in an equally likely scenario, the front brakes could fail first. That means either of two similar scenarios could occur. In one (as shown above) the loss of braking in the rear brakes goes unnoticed for a long time period, combining with a suddenly apparent failure of the front brakes. In the other scenario, the front brake failure is latent. A corrected version appears below. Note that the effect of this correction is to double the top event probability, making our design look even worse and making redundancy seem not so magic. 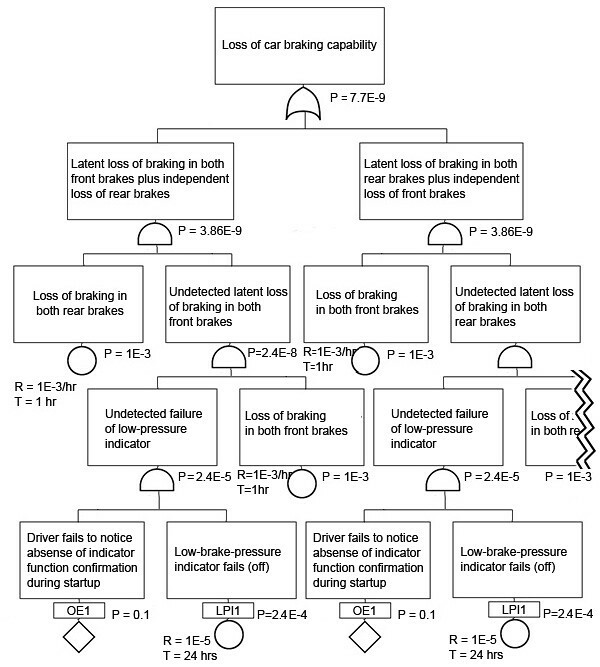 The fault tree tells us that our brake system design isn’t very good. We need to reduce the probability of the latent failures, thereby getting some value from the redundancy. We can do this by adding a pressure sensor to detect loss of pressure to front or rear brakes, along with an indicator on the dashboard to report that this failure was detected. To keep this example simple, assume we can use the same sensor for both systems. Despite being a latent failure, monitoring subsystems are usually more reliable than the the things they monitor. I’ve shown that in this example by using a failure rate of one per 10,000 hrs for the monitor equipment. With an exposure time of two years, the probability that the monitor is in a failed state during a drive is 0.16. Consequently, adding all the monitoring equipment only changed our top event probability from 1E-3 to 3.2E-4. It’s better, but not impressively so. And we added cost to the car and more things that can fail. 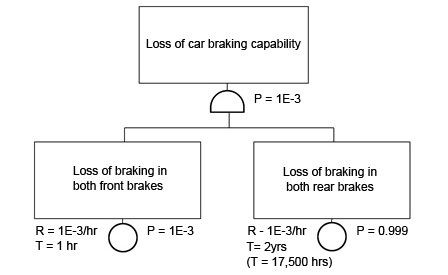 It’s important to realize that, at the bottom of the above fault tree segment, the exposure time to loss of braking in both rear brakes cannot be shorter than the exposure time to failure of its monitor. That is almost always the case for monitored components in any redundant design. We could reduce the top event’s likelihood by shortening the system’s maintenance intervals. Checking the monitoring system every 2 months, instead of two years, would get us another factor of twelve. But such an inspection need not verify that each element of the monitoring subsystem is separately functional. Logic allows us to see that we need only verify that it is or is not capable of monitoring a failure as a group. For now, if it’s failed we aren’t really concerned with what went wrong in particular. We can test the monitor by inducing it to test for pressure when none exists. If the monitor reports the condition as a pressure failure, it is good. We don’t need an auto mechanic for this. The driver could run the test on startup. We’ll design the monitor to test for no pressure as the car starts, when no brakes are applied. We call on the driver to verify that the warning indicator illuminates. Two failure modes of the monitored brake system – which now includes an operator – should now be apparent. An unlikely failure mode is that the indicator somehow illuminates (“fails high”) during the test sequence, indicating no pressure at startup, but fails to illuminate when no pressure is applied to the brakes. A far more likely fault state is operator error. This condition exists when the operator fails to notice that the startup test sequence does not display the illumination. This fault does not involve exposure time at all. The operator either remembers or forgets. For an untrained operator, the error probability in such a situation may be 100%. A trained operator will make this error somewhere between one and ten percent of the time, especially when distracted. Two operators who monitor each other will do better. Two operators with a check list will do better still. While the system we’ve modeled here is not representative of modern brake systems (and my example has other shortcuts that would be deemed foul in a real analysis), this example shows how fault trees can be used in preliminary system design to make better system-design choices. It really only begins to make that point. In a quad-redundant flight control system, such analysis has far more impact. This sort of modeling can also reveal weak spots in driverless cars, chemical batch processes, uranium refinement, complex surgery procedures, cyber-security, synthetic biology, and operations where human checks and balances (a form of redundancy) are important. 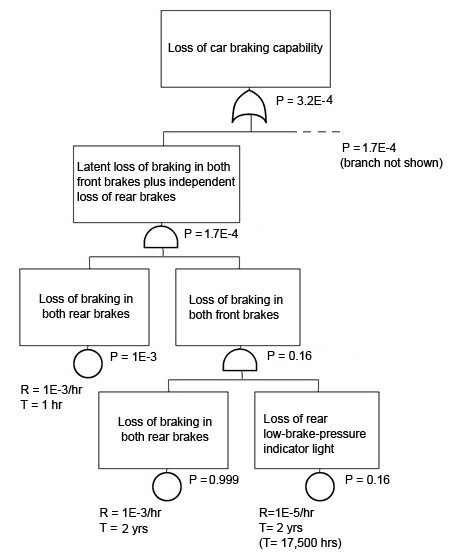 In the above fault trees, two similar branches appear, one each for front and rear brakes. The real-world components and their failures represented in each branch are physically distinct. In the final version, immediately above, indicator failure and operator error occur in both branches. Unlike the other initiator events, these events logically belong to both branches, but each represent the same real-word event. The operator’s failure to verify the function of the pressure warning indicator, for example, if it occurred, would occur in both branches simultaneously. The event IDs (e.g., “OE1” above) remind us that this is the case. Appearance of the same event in multiple branches of a tree can profoundly impact the top event probability in a way that isn’t obvious unless you’re familiar with Boolean algebra. We’ll go there next time. Risk culture has been a hot topic of late. For example, it’s common to hear claims that culture is the most undervalued aspect of risk, or that it is the element most critical for the Board’s management of risks. If that seems a stretch, consider our recent credit crunch, and see the film, The Big Short. The importance of culture in corporate risk may be the one thing on which we all agree – all but a few die-hard quants. Despite agreement on the importance of risk culture, the topic gets rather thin coverage in many frameworks. What then, might an ideal risk culture be? On most accounts, risk culture involves the values, norms, beliefs, ethics and attitudes about risk shared by a group. Most writings on the topic also include the claim that senior management must be the driver of change to an effective risk culture. It’s a plausible claim, since there are few alternative sources. Regulatory bodies don’t seem to have that effect on employees, and organic growth of optimal risk culture seems unlikely. Two fields I have experience in – aviation and pharmaceuticals – immediately come to mind. In aviation, risk is deeply embedded at nearly all levels of organizations. Oddly, the aviation industry started out with an affable relationship with its regulator. It has cooled slightly in recent decades, but is still today far from contentious. In pharmaceuticals, risk culture is poorly developed, and relationships with the FDA are often adversarial. This dichotomy likely stems more from accidental environmental factors than from any inherent differences in dispositions or competencies between the fields. Commercial aviation was lucky enough to emerge at a time when the FAA was so resource-strapped that it was forced into a tight partnership with aircraft builders – a situation from which we all benefited greatly. The early FDA had a much broader scope, and was regulating a vastly larger number of suppliers (food, drugs, tobacco, etc.) who were much less virtuous. The FDA’s short leash had the unwanted side-effect of fostering a culture where risk management is equated with regulatory compliance. Attempts to move beyond that state (e.g., in ICH Q8, 9, and 10) have been slow to progress. Lessons from the comparison between the two fields? To start, risk culture is real. Safety risk in passenger flight has fallen by a factor of a thousand or more, in a risk culture that extends from subcontractors to pilots to controllers. Technological advances cannot claim all the credit for this. Aviation workers are proud of their work. The motivation for doing the right thing is intrinsic, and the goals of workers align reasonably well with those of management and regulators. Second, no external agent (agency) can supply your firm with risk-avoidance. A regulator might protect society from a firm’s evils and errors, but it won’t protect the firm from itself. The FDA only cares about a pharma firm’s bottom line to the extent that it seeks to prevent drug-availability crises. The uncommonly beneficial state of risk culture in commercial aviation, which was not imposed, but grew organically, could be taken as an argument that kick-starting something similar in a random firm will be impossible. It need not be. But it will require a different tool kit than what’s in the standard ERM bag, because we’re now squarely in the realm of Change Management. Michael Beer and John Kotter are my two favorite Change Management writers (Beer hates the term). They disagree on quite a lot; but they agree that any time the CEO needs to push a cultural change downstream, he first has to be seen as walking the walk. That is, there must be a vision; and management must embody it. The vision need not be mystical, Beer points out. Further, employees must believe top and middle management is committed to the vision; and that management isn’t shallow, or deceiving themselves with hogwash about yet another strategic initiative. 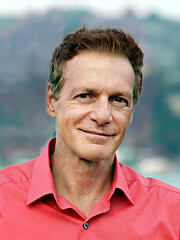 Kotter and Beer, along with Bert Spector and Russell Eisenstat, all agree that under-communicating the vision – in this case, the risk culture objective – is a leading cause of failed transformation efforts. Frequent communications, using every possible channel, over a long period, are essential. The purpose is not to coerce workers into compliance. It is to demonstrate the relevance of the vision and to train by example. Kotter notes that even with several communications per week, if management behavior is antithetical to the vision, cynicism spreads fast, and no one believes the communications. Drawing on the aviation example, I think we might strengthen the Change Management experts’ points for the specific area of risk culture by observing that clear goals, purpose, autonomy, continuous feedback, and a sense of control greatly add to development of inner standards and pride of work. These intrinsic motivators apply at levels from factory workers to the CFO. Worker engagement leads to trust; and trust promotes acceptance of shared values, norms, beliefs, and ethics, which is what definitions or risk culture rightly tell us should be our goal. Last week I showed how to begin building a fault tree from the top down. explained a tree’s structure, and looked at intermediate events and their associated logic gates. Now we can briefly cover initiators, the events at the bottom of the tree. 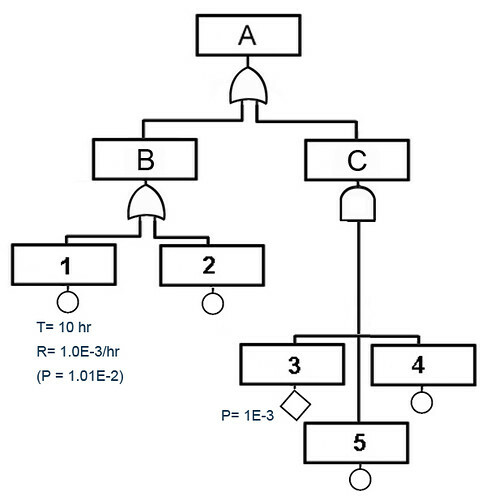 In most fault trees, most initiators get their probability values from the failure rate of a component related to the specific failure mode in question, and from the time window during which the mission or operation is exposed to that failure. For example, resistors fail by open more often than they fail by short , and the consequences of those two failure modes is often very different. Some missions are exposed to certain failures for a fixed number of times regardless of the length of the mission. Aircraft are exposed to aborted takeoffs commanded by the control tower at some historical rate. This has nothing to do with the duration of a flight. Initial Public Offerings occur once in a firm’s lifetime, and occasionally fail miserably at a low historical rate, often with no chance of recovery. If modeling these events, you might infer their probabilities from the known cases in the total population. Most hardware failures and many human errors are modeled as occurring at a fixed rate over the duration of a mission or lie of a project. This assumes, in the case of mechanical or electrical equipment, that infant-mortality cases have been removed from the population by a burn-in process, as is often applied to 100% of semiconductors in critical applications. Likewise, wear-out failures are prevented in critical applications by maintenance, non-destructive testing, and replacement of finite-life structural components. Between the extremes of infant mortality and wear-out – during the “useful-life” period – most equipment fails at a roughly constant rate. During that normal-life period, the probability of failure during a mission (e.g., a flight, reactor-time in a chemical batch process, or the time between scheduled maintenance in power-generation) is a simple function of the exposure time and a historical failure rate. where “e” is Euler’s Number, the number having a natural log of 1. As a historical note, when the product R * T is small, you can approximate P as P = RT and leave your slide rule in the desk. Otherwise, fault tree software will let you supply values for R and T and will calculate P for each initiator event where you didn’t assign P directly. As another historical note, events for which P is supplied directly are sometimes called “undeveloped events” and those given R and T values are often called “basic events.” “Undeveloped” partly stems from an old practice of braking trees into chunks to ease computation (the top of one tree supplying the probability to an “undeveloped” (developed elsewhere) event. Try to avoid this; it risk grave computational errors, for reasons we’ll cover later. I’ll call any event that doesn’t have kids an initiator. You might be wondering where failure rates come from. Good question. Sources include GIDEP, IEEE 500, Backblaze hard drive data, USAF Rome Laboratory, MIL-HDBK-217F, and RIAC. And those who write procurement specs should require vendors to supply detailed data of this sort. Above I used the example of different failure rates for the different failure modes of a resistor. Since the effort of building fault trees is usually only justified for catastrophic fault states (hazards), you’re unlikely to see a resistor failure appear as an initiator. The top-down development of a tree need only descend to a point dictated by logic and availability of historical failure-rate data. So initiators might specify a failure rate for electronics at the “box” (component) level or perhaps the circuit-board level when a box contains redundant boards, as would be case for an auto-land controller in my aircraft braking example. For fault-tree purposes, human errors are modeled as faults. Error is generally modeled as the probability of a mistake or omission per relevant action. This typically enters fault trees as events involving maintenance errors and primary operator errors – like pilots for aircraft and chemists for batch processes. Fault trees point out the needs for operator redundancy and for monitors. Monitors might take the form of more humans, i.e., inspectors or copilots. Or monitors might take the form of machines that watch the output of human operators or machines that check the output of other machines. One thing history has taught us – in general, humans make poor monitors, particularly when called upon to ensure that a machine is working properly. Picture Homer Simpson, eyes glazed over, while the needle is in the red. Bored humans do poor work (reminder: blog post on human capital risk), and scared humans are even worse. This is particularly relevant for critical operations in degraded systems where skill is required – think fighter pilots and deep divers. Commercial aircraft operation uses redundant pilots and redundancy in critical procedures to deal with errors of omission. Knowledge of error criticality does little to prevent critical errors. For example, failure to deploy flaps for takeoff – about as critical an error as can be imagined – resulted in several crashes, including Delta 1141 in 1988, despite redundancy and checklists. Non-human monitors of humans’ configuration of control surfaces is a better approach. Fault trees are great for helping us allocating redundancy in system design. To get this right, we need to take a close look at the failure rates and exposure times supplied to initiator events in redundant designs. I intended to cover that today, but this post is already pushing the limits. I’ll get to it next time. In the meantime, consider two other aspects of redundancy, failure rates, exposure time, and probability. First, imagine two components in parallel, each having P = .01. This arrangement may cost much less than one component having P = .0001. Then again, two components in parallel will weigh more than twice the weight of one, and will take up at least twice the space. Second, consider the fault-tree ramifications of choosing the two-in-parallel design in the above example. Are there any possible common-mode (or common-cause) failures of both the components? What happens if one explodes and takes out the other? What happens if the repair crew installs both of them backwards after scheduled maintenance? ISO 31000, along with other frameworks, uses a definition of risk that is not merely incompatible with the common business and historical usage; it is highly destructive to its own goals. A comment on a recent LinkedIn post about “positive risk” asked fellow risk managers, “can we grow up?” I share the frustration. ERM must step into the real world, meeting business on its own terms – literally. The problem with an offbeat definition of risk isn’t just a matter of terminology. The bad definition is at the heart of several derivative concepts, which ultimately lead to contradictions and confusion. That confusion is not lost on CEOs and boards of directors. Proponents claim that these audiences welcome ERM and that they align strategies accordingly, e.g. COSO 2009: “boards and management teams are embracing the concept of ERM”. But dig into this recent Deloitte survey, like many before it, and you’ll see that the self-congratulatory self-assessment projected onto boards comes with some less optimistic hard data. For example, Deloitte’s data actually shows that just over half of even financial-service boards get updates on top risks, and less than half of those get such updates more than once a year. I’ve recently had the chance to speak about risk management with a few Fortune-500 CEOs (telecom, insurance and healthcare) and a number of their board members. Unsurprisingly, these folk tend to be learned – some downright expert in science and math. Many were aware of ERM’s quirky use of “risk” and related terms central to science, and did not need prompting to express dismay. All five healthcare execs I spoke with told me their boards have no contact with ERM output. A retired CEO told me she suspected that ERM’s “positive risk” concept is a turf grab – a way for risk managers to inject themselves into strategic decisions. Of course, risk managers have good evidence that risk should move upstream in the decision process. But idiosyncratic language and muddled reinterpretations of core analytical concepts are unlikely to persuade educated executives. If you think otherwise, try searching the web for praise of an ERM framework by a board of directors or top executive. To understand why the issue of defining risk is one of several big changes that ISO 31000 and some of its brethren must undergo, a historical perspective on risk and the roots of ERM’s conception of it may help. Then Geralomo Cardano realized that, whether or not through the will of God, rolling two dice resulted in more sevens than twos. Pascal and Fermat later devised a means of calculating probability based on a known problem-space. 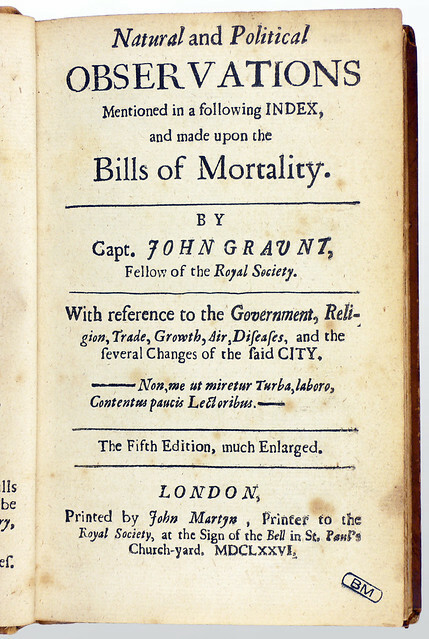 Soon after, John Graunt realized he could predict future death rates based on historical data.and, With help from Huygens and Bernoulli, statistical inference was born. While annuities and mutual-aid societies existed in ancient Rome, modern insurance had to wait for Graunt’s concepts to spread. 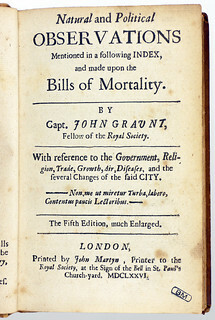 Only then could probability and statistical inference (as these terms are used where italicized above) become a rational basis for setting premiums, as shown by Edmond Halley, who discovered other regularities in the natural world. Risk insurance was soon widespread. Risk‘s Latin root means danger, and that’s how the term was used in insurance. The 1828 American Dictionary of the English Language says risk signifies a degree of hazard or danger. It explains that “the premiums of insurance are calculated upon the risk.” In insurance, science, medicine, and engineering, risk is a combination of likelihood and severity of a hazard (potential loss); and that how the term is used everywhere outside of ERM and some Project Management imitators. Further, in Google’s data “positive risk” or similar expressions do not occur in the first 10,000 bi-grams ending in “risk,” despite the popularity of that concept in blog posts and on LinkedIn. Defining risk as the effect of uncertainty on objectives causes many problems. One is that we don’t know the context of uncertainty; another is that it omits mention of loss. The rationale for this omission is that the consequences associated with a risk can enhance the achievement of objectives. This rationale confuses risk-reward calculus with the concept of risk alone. Despite claiming to be neutral about risk (not the same thing as risk-neutrality) nearly all usage in the ISO 31000 is in terms of risk being tolerated, retained/transferred, shared, reduced, controlled, mitigated or avoided. To understand risk as the effect of uncertainty on objectives, we must know what is meant by uncertainty. Again, this isn’t just an exercise in philosophy of language. Uncertainty has been a problem term since Frank Knight (Risk, Uncertainty & Profit 1921) chose to redefine it (misuse, according to Frank Ramsey and other of Knight’s contemporaries) in two ways – incompatible with each other and with the standard use in math and science. We see echoes of Knight’s work in risk frameworks. Even in the charitable interpretation, Knight’s usage makes dialog with math and science nearly impossible, since in those realms we call the measure of uncertainty probability, (whether the frequentist or subjectivist variety). That is, it is not merely Knight’s language that is at odds with math and science, it is his world view and ontology. 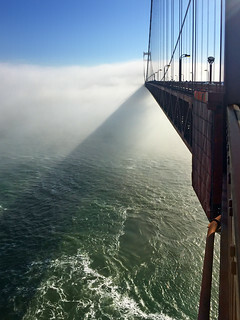 If the uncertainty in ISO 31000’s definition of risk is the Knightian variety, i.e., ignorance, then uncertainty describes an agent’s state of mind.The immediate effect of that uncertainty is necessarily a reflection on his/her/its ignorance, if there is an effect at all (a person unaware of his uncertainty would not be uncertain). Given that the only possible first effect of awareness of a state of ignorance is cognitive or emotional, defining risk as the effect of uncertainty (the sort of Knightian uncertainty described above) is unworkable. Risk is certainly not an emotional response or a mental state of reflection, yet that is what a literal reading of ISO 31000 would require, assuming Knightian uncertainty. If instead of Knight’s understanding of uncertainty, we use the math/science meaning of the term, things are only slightly better. If uncertainty involves a known problem space (as opposed to ignorance) the effect of uncertainty in any situation would be to affect our decisions. We might deliberate on what to do about quantified uncertainty (and therefore quantified risk). If we follow a subjectivist interpretation of probability we might choose to gather more information with which to refine our estimated probabilities (modify our uncertainty by updating our priors). But in neither of these cases, where uncertainty is not ignorance, would we call what we’re doing about uncertainty (the effect it has on us) “risk.” Here, uncertainty is a component of risk; but risk is not the effect of uncertainty on objectives. An obvious remedy is to abandon arcane conceptions of risk and accept that a few centuries of evolution of rational thought has given us a decent alternative. Risk is a combination of the likelihood of an unwanted occurrence and its severity. This holds however we choose to measure or estimate likelihood, and regardless of how we measure severity. It does not require that we multiply likelihood times severity; and it allows that taking risks might have benefits. Further, it addresses the role of analysis of risks in decision making, i.e., “objectives.” I think this is where ISO 31000 was heading, but went off course, leaving much confusion in its wake. It’s time for a correction.